This short, little-used trail leads to an old lookout site with a great view of Hills Creek Reservoir and much of southeastern Lane County and the Cascades. 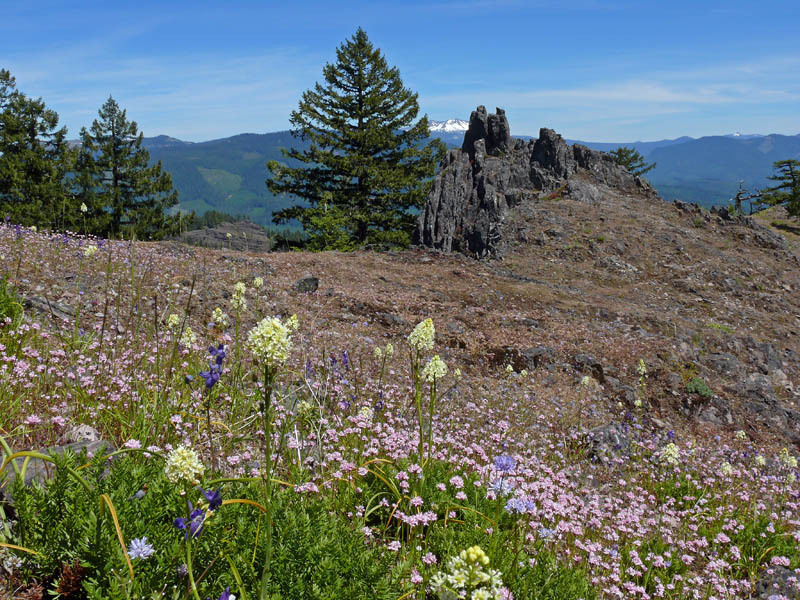 A rocky ridge with even more flowers is hidden by a short stretch of trees just below the summit. 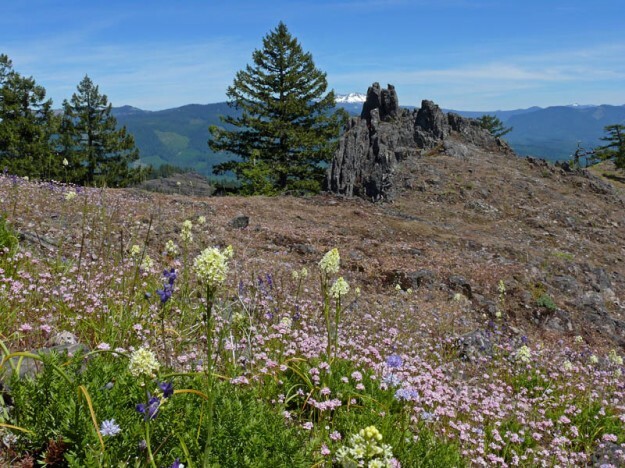 It has unusual plants at both the southern and northern ends of their ranges—a good example of how this part of the Western Cascades, known as the Calapooya Mountains, is the dividing line between the Rocky Mountain Floristic Province to the north and the California Floristic Province to the south. Drive east on Hwy 58 for 2 miles past Oakridge. Turn right toward the Hills Creek Dam onto Kitson Springs Road. After 0.5 mile turn right onto Rd 21, “Diamond Drive”. Follow Rd 21 for 16.3 miles. Turn right at Rd 2127. Cross a bridge and continue on Rd 2127 for 3.9 miles. The road soon turns to gravel. Stay right onto what is now Rd 5850. Continue for 3.5 miles to a hiker symbol sign on right. Park on left side of the road. If the Google Earth image doesn’t load properly or you lose the location, just reload the page.